Major Chinese mobile wallets Alipay and WeChat Pay both saw an uptick in engagement with their “red envelope” features — a digital spin on the Chinese tradition of gifting money to friends on special occasions — during the Spring Festival from February 4 to February 9 this year, according to China Daily. The number of red envelopes sent on WeChat Pay grew 7% year-over-year (YoY) to reach 823 million, while 450 people participated in Alipay’s “five blessings” game to receive lucky money, up 40% annually. The popularity of this digital version of a cash-gifting tradition reflects the overall trend in China away from cash. Cash usage in China declined 10% over the last two years and ATMs have plummeted, with 100,000 closures anticipated by 2023. And mobile payments have reached ubiquity, with 92% of consumers using Alipay or WeChat Pay as their primary payment method. The nationwide shift away from cash and toward digital payments likely contributed to the uptick in sending digital red envelopes, as fewer people presumably wanted to receive cash. Additional capabilities that promote engagement and spending could provide both mobile wallets with new sources of volume as they face domestic growth barriers. 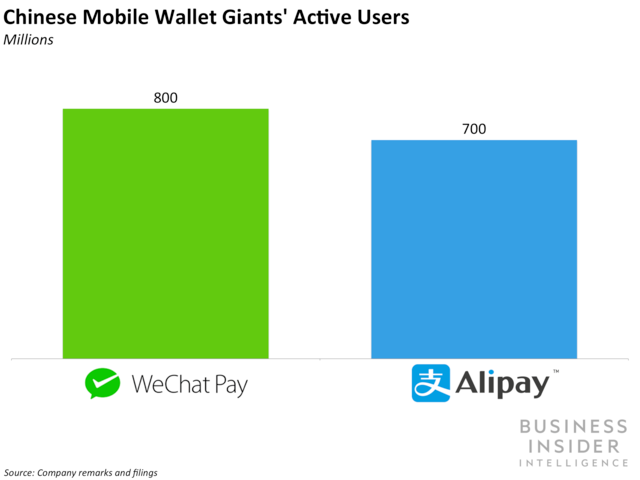 Volume opportunities beyond in-store transactions are necessary for both Alipay and WeChat Pay: Wallets are reaching ubiquity in China, and central bank regulations are imposing a 500 yuan ($74) daily cap on barcode-based mobile payments in an effort to combat fraud. This makes increasing engagement especially important for mobile wallets in China, where services similar to red envelopes — which are exchanged beyond the New Year for special occasions like weddings and birthdays — could give users more reasons to spend on the platforms. Further, red envelopes were instrumental in propelling WeChat Pay to the forefront of the Chinese mobile payments landscape when the service launched in 2013: Its red envelope feature went viral and 55% of China’s population sent red envelopes during the Lunar New Year in February 2018, for example. Continuing to launch more features that give users opportunities to engage with and spend on the apps can drive volume for both services.